Over the years the bridal look has also changed. Red used to be the bride's colour, but today, is experimented. Lehenga cholis are more popular for weddings. Brides also go for fashionable salwar-kurtas. Over the years the bridal look has also changed, along with changing times and changing fashion trends. A few decades ago, red was the bride's colour. But today, there has been a lot of experimentation. Apart from shades of red, to magenta and pink, out of the ordinary colours are also being used for the bride's dress - like sea green, turquoise blue (feroza), lavender (pinkish mauve), strawberry, fushcia, rust, copper, purple and so on. Two colour combinations are also popular. The prediction is that colours like purple, sheer gold, peacock blue may be the new trend in bridal wear colours, used with contrasting colours, like purple and pink, gold and rich green and so on. Lehenga cholis are more popular for weddings. Brides are also going for fashionable salwar-kurta, with short and richly embellished kurtas. As for saris, they are being worn differently, instead of the traditional way, so that they show off the choli and the heavy "aanchal". A new trend are the stitched saris, which do not have to be draped, but can just be slipped on. The saris are stitched in innovative ways, showing off the cholis and "anchal". The focus is on cholis, with low and decorative backs, with halter necks or tie-ups. The blouses (or choli) for both lehenga and saris are certainly heavily decorated. Plain one colour cholis or blouses seem to be out of fashion for weddings. Instead of straight sleeves, the sleeves may be shorter, with scallops, or in a magyar style. The same goes for necklines. Decorative necklines, high at the back and low in front, halter necks, octagonal, scalloped, or backless, are in fashion, rather than plain round or v-necklines. The cholis have a richly decorated look, either made out of brocade material, or carrying heavy work with tiny sequins. Crystals (small glass pieces) or tiny beads are being used, along with zardosi work. The entire look, however, is not garish. Bright gold zardosi is out of fashion. If one wishes to wear gold, it is dull gold. Silver, or work done in dull copper or bronze are also being seen. Whatever sparkles there may be are being done with crystals, sequins, beads or tiny mirrors. 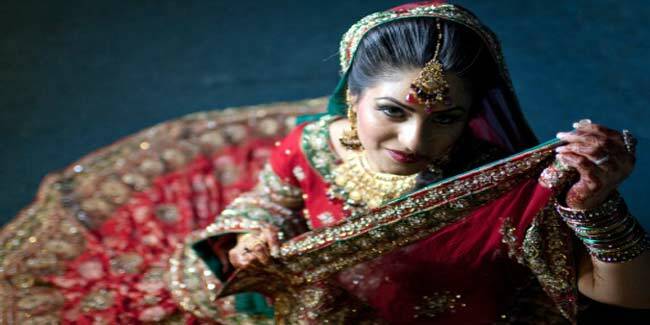 Some years ago, a bride used to be laden with heavy gold jewellery. But the trend has changed. Diamond or white stone jewellery, or coloured stones are in fashion. Dull or oxidised gold is also being used, along with silver and platinum. Necklace and ear rings, studded with diamonds or white and coloured stones are popular. Stone setting, kundan, polki, semi and precious stones combined together, are all the rage. Different alloys are being used too and different kinds of finish are also being used, even with gold, like matte, oxidised and antique look.